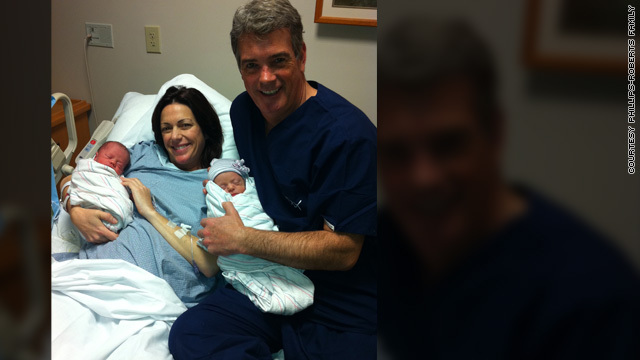 Double the congratulations for CNN's Kyra Phillips and fiancé John Roberts - the couple welcomed both a boy and a girl into their family right after midnight on Tuesday, March 15. The little ones are named Sage Ann and Kellan Clay, with Sage arriving at 12:03 a.m. and Kellan making a debut two minutes after. "Sage came out with her arms open wide ready for a hug," Phillips said in a statement. "Kellan came out feisty – ready to conquer the world!" Phillips continued, "It doesn't get much better than that. For John and me, we now have everything we could ask for." « Previous entry‘Chuck’: Where have all the missions gone? (Correction on the word there) congratulations to two great anchors on their beautiful twins. I am so happy for Kyra and John .They make such a lovely couple and I am sure the twins have brought them closer together. congrats to KYRAand JOHN .!! I would like to extend the "biggest" CONGRATULATIONS to Kyra and John as they celebrate the births of their twins.! Totally AWESOME for both Kyra and John. Congratulations again! Congrats alot. i wish u the very best! and to the people out there who r racist... i thought that was over years ago man. Get real homies! YEA!! CONGRADS!!!! youve got ur hands full best wishes. Yeah, I've heard the "piece of paper" argument so many times, but when you're going to have a child, just get married and make it legal, there's nothing wrong with THAT, is there??? It has nothing to do with what century we are in, being married first and having children after that has always been the truly decent thing to do. Time won't erase that, no matter how shabby people's morals have become in this century. There's nothing to be heroic or modern about having kids out of wedlock. Agreed with her comment. How can you have grown children who you should have taught to have morals and then turn around and have twins with another anchor without being married and then go on to host a show about "Raising America" and kids. What are you telling them? Have children without being married = ILLEGITIMATE. I was surprised when I learned this almost 3 years later. Good thing she is not doing that show anymore. Congratulations! Having a baby is a wonderful thing but having twins is just awesome! Being a mother of 4 year old twins (boy & girl), I know how excited you both are. As you both start you family, just remember that caring your twins is truly just the start of the fun to come. Pretty soon Kyra will be married, two kids, and her husband a control freak. How is this news?? People have kids daily but it isn't posted here. Why not?? More children born out of wedlock, what a screwd up world. Couples do not love one another to make a committment to marry. Kids don't have a chance. Congrats on those excellent twins!!! My wife and I are huge fans of both of you. May You're life continue to be blessed. May the twins grow to be healthy and wise. (unlike some of these mammals posting messages here. Much love and happiness to the whole familly! But Mary was a virgin and all these babymamas are ho's and welfare mamas and babymamas and just a drag on society. They shred the moral fabric of society and are lazy good for nothings. These baby mamas do their children more harm than good. Just look to the prisons for proof. Lets not confuse the Virgin Mary with all these babymamas. Didn't she just get divorced from her muslim husband last year? She sure didn't waste any time getting back on the saddle. to all of u so called "christians" with ur moral compasses out, I raised my child by myself for the past 12 yrs and our home is more peaceful and happy than most two parent homes where the adults are pretending to like each other while living in sin behind each others back! That scenario happens more and more with u do gooders so stop pointing fingers and stfu. WHO ARE THESE PEOPLE AND WHY DO WE CARE?? I'm apalled to read these comments others have to say about such a BEAUTIFUL BLESSING. To first read ignorant, non-intelligant comments about the baby's skin color. Then to read how people are more concerned with their marital status and not the fact that the babies are healthy. Last I checked the year was 2011. You don't need to be married to have a baby. To Kyra and John please excuse the rediculous negative comments and accept my sincerest well wishes. May your children learn a valuable lesson and turn put to be better human beings than the ignorant ones that posted their thoughts on your birth announcement. Congratulations to you both & welcome to parenthood...its the best job you will ever have. CONGRATS 2 THE COUPLE..PLEASE PEOPLE LEARN HOW 2 SPELL...INSTEAD OF HATE N BASHING..WE SHOULD BE GRATEFUL 4 WHAT WE HAVE IN LIFE. I don't know these people, but Tony Iommi is my god. I know a couple that are super Christian, and each had a baby out of wedlock. Then they met, got married and are on there 6th kid 4th together, and expect there church to help with like Christian welfare. Never amagined that so called christians could say such ugly things.Some are just coocoo.Enjoy the birth of your children.That's what's wrong with our world,looking @ other instead of looking @ self.God Bless. Congrats to a wonderful couple. John, I am a huge fan from back in your Much Music VJ days. I still remember your classic interview with Black Sabbath's Tony Iommi on the Pepsi Power Hour back in 1986. You rocked then and you rock even more now! Kyra, you rock too! Here's wishing you many years of happiness with your little bundles of joy. what is wrong with some of you people? some of you are rude and just plain mean. people do not need to married to have kids brought up to be great people. what? some of you people would rather people get married and be unhappy and then possibly making the kids unhappy. I agree with you. So many people who have been commenting here are poorly-spoken, over-zealous, rude, cruel, and plain unkind. What is this world coming to when one reads such foul comments. Yes, there is free speech, but if you have nothing nice to say, don't say it. yeah ! thats telling them. buncha dang food eaters. i bet they have bad breath too. To ALL you "good" "Christians": Had Nero done a better job this world would be a lot kinder. To you other idiots: Had my relatives won WWII, you would be bars of soap. But then, you'd be useful for something. To the happy couple and their children: Congratulations! And ignore the riff-raff. Once upon a time......on City TV....we watched an guy, known as "JD".....his career moved on...and so did he........today he is a Dad, as happy as can be!! All the best to you and your beautiful family John....Toronto still loves and remembers you!! Congrats to the happy couple for such a blessing. Congrads to my wifes high school friend. (Helix 1986) Wishing you and your family all the best. Congratulations to the whole family. Oh, it's *that* John Roberts. For a minute there I had a vision of her on all fours saying "Is that a gavel under your robe, or are you just happy to see me?" Does it matter that they're not married? why can't 2 people who are in love need to be married to have a child/ children? i wish both babies, mother and father nothing but joy and happiness! CONGRATS! to the mother and father don't listen to the negativity. This is not entertainment news. CNN reporters, although on TV, are not celebrities. How vain of a supposed "news" network. Congratulations to you both! I have been a fan of John Roberts since his days as a VJ in the early 80s on New Music Magazine (TV program). Then, he went to CTV. I was happy to see him join CNN, but sad to see him leave. Have also been a fan of Kyra Phillips since she started with CNN. She's bright, personable, engaging, direct, and has a sense of humour. I wondered what happened to John . Was there a particularq reason for leaving CNN? I wish him well wherever he goes and gongrats on the twins. He went over to FOX News (yikes), but I miss him on CNN. Same with Tony Harris. CNN has lost great anchors and reporters in the last two years in particular. All you negative so called christian people are sick! Your what's wrong with the world! Congratulations to Mom and Dad!! What an exciting time. You will have so much love in your house and you will wonder how you ever got along without the little munchkins before you had them. Children add a new dimension to your home, your life, and to your soul. They awaken something in you that you never knew existed. The babes look lovely. Sylvia Tyson said "you don't own your children, you only get to borrow them for a while" and I know that is true since my kids are now grown. My advice....keep your sense of humour at all times. canadians can go f themselves with their opinions. Two kids born out of wedlock with over-the-age parents destined to be raised by an illegal immigrant nanny is pure americana! but on the positive side, fox news just gained 2 more future watchers! What's w/these so called Christian responses -honestly!! Are these fake babies or props from the Twilight series ? They look very odd. how are 2 guys having babies ? are they one of those progressive homer couples ? Wow- such insightful comments!! Instead of spending your time writing CRAP-you may want to find a dictionary on line that way when you do post your CRAP at least it will be spelled correctly. Get a life! They're happy and have healthy babies. I absolutely cannot believe some of these hateful and nasty comments. Congrats to Kyra and John, lovely couple, now children to add to the mix. Couldn't happen to a nicer couple. I say congrats also, they look so happy! Congrats to Kyra and John; I've enjoyed watching her for years. Back in September, during a routine visit to my perinatologist, Kyra walked into the office, so I realized she was pregnant then and have had her in my thoughts since that day. I didn't get the chance to say "hi" and tell her that I was a fan as my routine visit to my peri became an emergency situation; I was rushed upstairs and my own boy/girl twins were born a couple of hours later. I'll always associate seeing her in the doctor's office with my own very special delivery that day. Being the new mom of twins hasn't been easy, but I wake up everyday amazed at my good fortune when I look into their little faces. I wish Kyra and John the best in the sleepless days and nights ahead! Is her baby daddy the guy from CBS? A child is a gift from god and twins are a double blessing, so congrats. So how in the world are hurtful and hateful things that are said to the new parents going to make the fact that thay are not Married any better ? I too wish that they had married before bringing a child into this world siince each child deserved to be born legitamite. To call hateful names in no way makes this better for the children.. so for heavens sakes STOP. So, since the parents aren't married, the babies aren't legitimate? How is a person not legitimate? What is it about a legal contract that somehow would make these babies legitimate? They're perfectly fine just the way they are. Yes I do agree with you in that why do people have to say such hurtful things on a day that is so full of joy- that being said- you said" I wish the baby would have been born legitamate" What is this 1903??? Really?? Legitamate?? Come on!! These two people are in a committed relationship. A piece of paper does not make it any more committed- have you seen the stats for divorce in your country?? All that matters is that these two precious children are unconditionally loved. Twins, or any baby, deserve parents that make a legal commitment. It's a good start! They became engaged last year, so they are committed. They are committed to one another!! Does having a piece of paper make you feel anymore committed. Have you seen the divorce rate for your country- that piece of paper means squat without a deep and fundamental committment to one another-because without that- it's JUST A PIECE OF PAPER!! With a divorce rate of 57% for first marriages and worse for 2nd and 3rd marriages, the chance the parents will be together 5 years from now is pretty slim. Instead of paying thousands for a grand wedding, and thousands more to a divorce lawyer, not to mention all the fighting and arguing, why not just put that money into an education fund for the kids? More and more women, especially professional women, are choosing to be practical and to have children on their own.